1In a bowl, mix oatmeal, onion & garlic powder, cayenne pepper, Italian seasoning, and nutritional yeast and set to the side. 2In a non-stick skillet (ceramic coated skillet works best), crumble drained tofu. 3Stir fry over medium heat until all water has evaporated – add turmeric towards the end of this process until all the tofu has changed color. 4Stir fry over medium-high heat until all ingredients are coated with oil (for about 1 minute). 5Drizzle two tablespoons of oil over tofu – give it a stir then add sunflower seeds, peppers, onions. 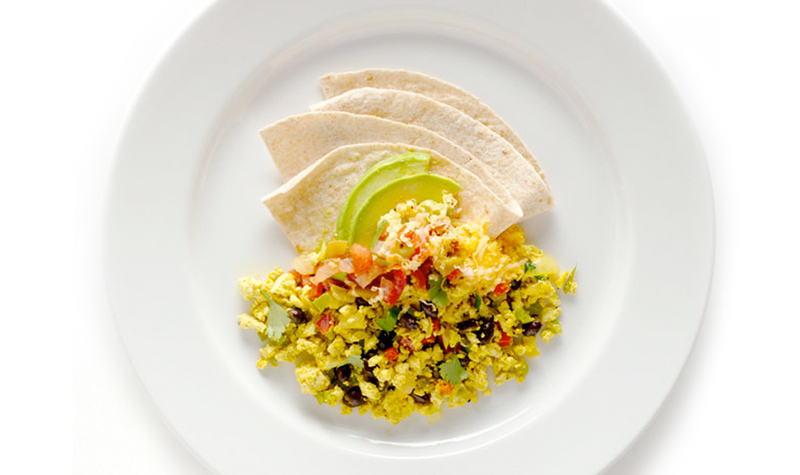 6Spray or sprinkle liquid Aminos over the tofu scramble. Stir fry for about 2 minutes to infuse the Aminos. Stir in the parsley.